This morning, US Open quarterfinalist Melanie Oudin was awarded the first annual Fed Cup by BNP Paribas Heart Award, given to a player who has represented her country with distinction, shown exceptional courage on court and demonstrated outstanding commitment to her team during the 2009 Fed Cup competition. 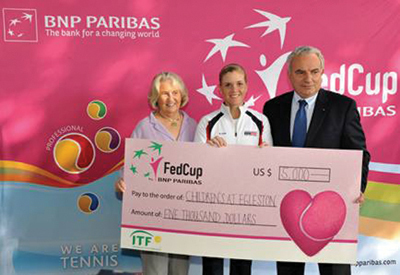 Oudin won the award via a public vote on the Fed Cup website and received a unique heart bracelet along with $5,000 which she is donating to Children’s at Egleston in Atlanta. Alexa Glatch of the United States and Italy’s Flavia Pennetta and Francesca Schiavone were the other finalists. Below is a photo of Melanie receiving the check alongside Lucy Garvin, Chairman of the Board and President, USTA, and Francesco Ricci Bitti, President, ITF.